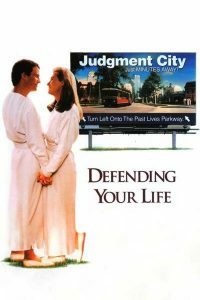 When I think about why I feel this need to transition from male to female, I think of a movie I remember seeing on a Sunday afternoon as a teenager: Defending Your Life. I’m not a religious woman, but I am spiritual. I do believe in reincarnation. This movie is one I’ve held very close to me since seeing it all those years ago. Now that I identify as transgender, I feel it holds an explanation I was looking for. 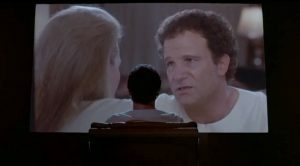 The movie, written and directed by Albert Brooks, revolves around Daniel Miller (Brooks), who is hit by a bus and dies. It is soon revealed that everyone, when they die, goes to Judgement City, where their life is evaluated to see if they move on, or return to earth to live another life. It is made quite clear that moving on is the preferable option, but also not quite as common as trying again. This trial… sorry, process… has Daniel looking at his fears and how he acted upon them throughout his life. After the first day, Daniel is a little down but meets Julia (Meryl Streep). Soon, these feelings are washed away as he falls in love. It starts to become apparent that Julia is going to have no problem moving on, while Daniel will probably be left to start a new life. Once Daniel’s process is over, it is determined that he has not overcome his fears and will have to return to Earth and start over. However, as he is on the tram out of Judgement City, he sees Julia leaving in another tram “moving on”. At this point, Daniel decides to runs across traffic to be with Julia. 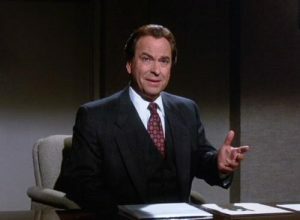 Having died in an auto accident, this act of courage shows Bob Diamond (Rip Torn) and the rest of the people from Daniel’s process that he has overcome his most basic human flaw, fear. They decide that since he has now overcome those fears, he is able to also move on with Julia. When I think about being Trans, and relating this movie to myself, I can’t help but think of myself in Daniel’s position. Sitting there, looking over what I had done with my life, I like to think I’m a good person, and have done a lot to improve myself. However, there is one thing that has haunted me, that I am only now beginning to address. In my early 20’s, I did quite a bit of reflection on whether or not I was Trans. At that time I was single, and a lot more of my thought process went towards finding a mate. If I were Trans, how would that affect my love life? How could someone love an abomination? Having kids has always been something I wanted, and how could I do that if I was Trans? How would being Trans affect my career? Most of these fears have since subsided. I’m very happily married to my wife, who shows no signs of leaving. Kids can always be adopted. My career has changed from what I thought it would be at the time to something else. So now I wrestle with the question of how would I defend myself in Judgement City if I just ignored that I felt this way all my life. Sure, there are still fears about transitioning, but as I progress, they seem less and less important. A lot of Trans people lose friends and family over it. I’ve come out to all my close friends and my immediate family, and there are no signs of anyone leaving. I want to touch on some harsh reality here. 41% of Transgender individuals attempt suicide at some point in their life. 41%! That’s almost 10 times the rate of the general population (4.5%) (http://www.usatoday.com/story/news/nation/2015/08/16/transgender-individuals-face-high-rates–suicide-attempts/31626633/)! I am luckily in the 59% who don’t attempt suicide, and certainly NEVER plan on it. However, I can’t say the thought of reincarnation hasn’t been a positive thought for me. Though, if I didn’t follow through with transitioning, I’m sure I’d just come back as male again, and that wouldn’t do me any good. So my only real option is to make the best of what I have and do what needs to be done, to love myself. Awesome choice to cover! It seems like a whole generation has run across this one from being bored on a summer afternoon while checking out what’s on Comedy Central. Which is a shame, because it’s an awesome one. While it’s coming from a completely different context, the lens this film puts on our fears speaks volumes to me. As time goes by and I look inward and backward, I find a massive portion of this life has been defined by my struggle to tackle fear. Whether it be “minor” ones (a bad fear of fireworks and thunderstorms”, to more deep seeded ones that require a massive amount of introspection. Either way, facing it can be and IS a real struggle, and facing it should never be taken lightly by yourself OR OTHERS. I’ll now pretentiously end this rant with a quote from another good one.